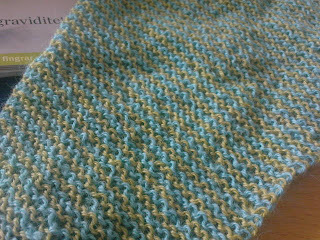 I've got so much on the needles right now, I don't know what to finish, or if, before I start the next project. It's quite frustrating, and I think it might be stress-related. I want my knitting to be relaxing, and not something I do to accomplish something when I feel lousy in other areas of life. I've frogged the last part of my February Lady Sweater (going on April Lady Sweater), and noticed that the miscoloured part shown in my last post was actually a few meters of a different dye bath felted to the original yarn. Not very classy, Cornelia Hamilton! I did email Mrs. Hamilton asking if this is what one can expect from this yarn (Heaven's Hand), but she claimed it must be a fabrication error and offered me 20% off in her web shop, which is kind of her I guess, but I don't shop online for things I can buy/squeeze/smell at my LYS. Anyhow. I've only got a few centimetres left on the body. Again. I'm thinking of making Ysolda's garter stitch mitts to go with it. But then it struck me that I'm going to a ball in a month, and I might need a new shawl for that. Fi gave me a luxurious purple lace yarn a few months ago, and I might turn it into a North Roë Shawl. Very pretty shawl, and free pattern! I'm not the happiest lace knitter, but I like shawls. And balls. After one month of knitting, and one week of thinking it's not really that bad, I've cast off the body of my February lady sweater, and 15 cm from the edge, at the end of the third skein, the yarn is much brighter than the rest of the yarn (yes of course it's the same dye lot, who do you take me for?) for four rows. I know hand-dyed means variations, but in no othe rplace on this garment is the difference in colour as distinct as here, and not for so long. The yarn is Heaven's Hand by Cornelia Hamilton. What should I do? Frog and reknit? Contact the manufacturer? Live with it? Help me! I'm no fan of frogging, and most of all I'm no fan of knitting the same thing twice, especially not when it's not a pair of something. But I don't want to have knit something I've longed to knit and wear and then hate it. Any advice?